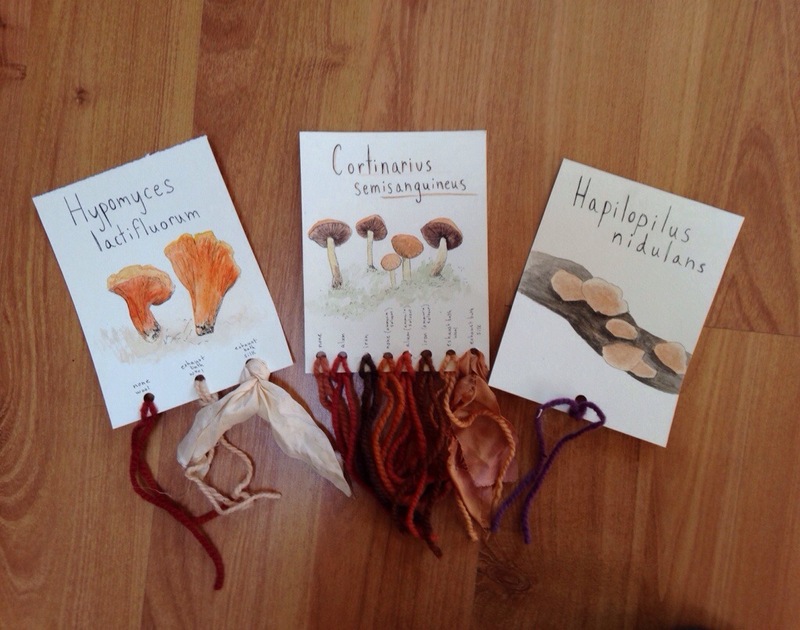 This past month I was lucky to be able to take a workshop on Mycopigments– or using mushrooms for dyes. If you want to schedule one for your town or learn anything about mushrooms for dye then go to the Mycopigments website! Alissa was a great teacher and everyone at the workshop had a great time. Who would believe that such plain and unassuming little mushrooms could produce a literal rainbow of colors? Needless to say, I learned a lot and have been a little obsessed ever since the day of the workshop. Basically during the class we used 9 different mushrooms and one lichen to create a whole range of colors. After the class I took home several of the used dye baths and two days later experimented to see what kind of colors the exhaust baths would yield. Now I am working on making a couple of things with my mushroom dyed yarns (and other things) as well as coming up with a little sample book with the drawings I love to make. 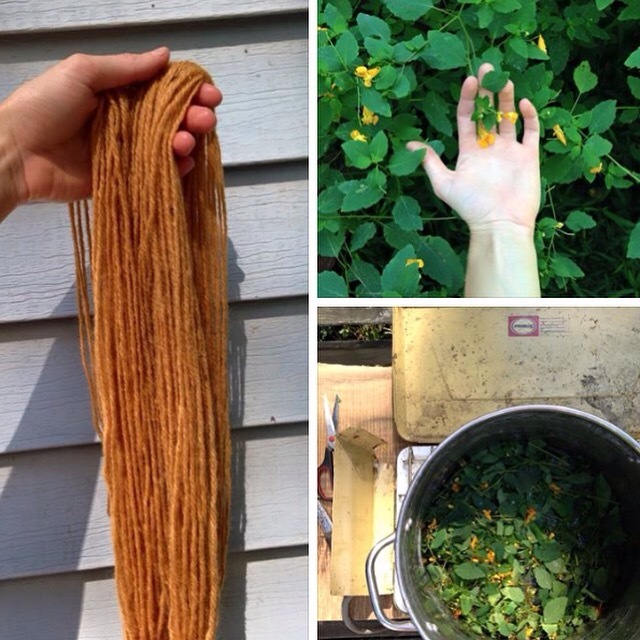 (You may be familiar with my plant dye sample book from photos in past posts). Here is a run down of how my exhaust bath colors held up against the original ones. Sorry if any of them are misspelled— I am writing them from memory. For the exhaust baths I had a half gallon mason jar of some of the dyes left over from the class. They all sat outside for two days and on the third day I had time to work with them. I spiked each of them with a little bit of alum and washing soda for a few. Then I brought the jars up to about 180 degrees, added my wool, and let them continue to receive heat for about an hour, hour and a half. Then I turned off the heat and let them sit overnight. The wool was pre-mordanted in alum back in the fall. Here are the results in order of most successful to least successful. Phaeolus schwenitzii— Great. The exhaust made a bright yellow almost on par with the first bath. Pisolithus tinctoria— Very successful. Dyed a medium brown in the second bath. Umbilicaria mammulata— Successful. It produced a lighter shade of purplish pink, but it was nonetheless stunning. Cortinarius semisanguineus— Pretty successful. Produced a much lighter orangish pink in the second bath. It looked more like the non-mordanted test sample we did in class even though my wool was mordanted in alum, but was still a nice color. Phaeolus schewnitzii with Iron— Somewhat successful. Even though I spiked the bath with some extra iron it still dyed a rather light green compared with the original. Perhaps the bath was a little older? Boleotopsis— Also only somewhat successful. It dyed a light blueish green in the exhaust. Not even close to the vibrancy of the original. Tapinella atomentosa— Somewhat successful. A much lighter and less interesting shade than the first bath. Hypomyces lactiflourum— The most amazing lobster red originally, this one did not come out at all in the second bath. It was a very very light pale color with a pinkish hue. I still used it, but this was not my most successful bath. And here are the things I have been making with my mushroom dyed yarn! 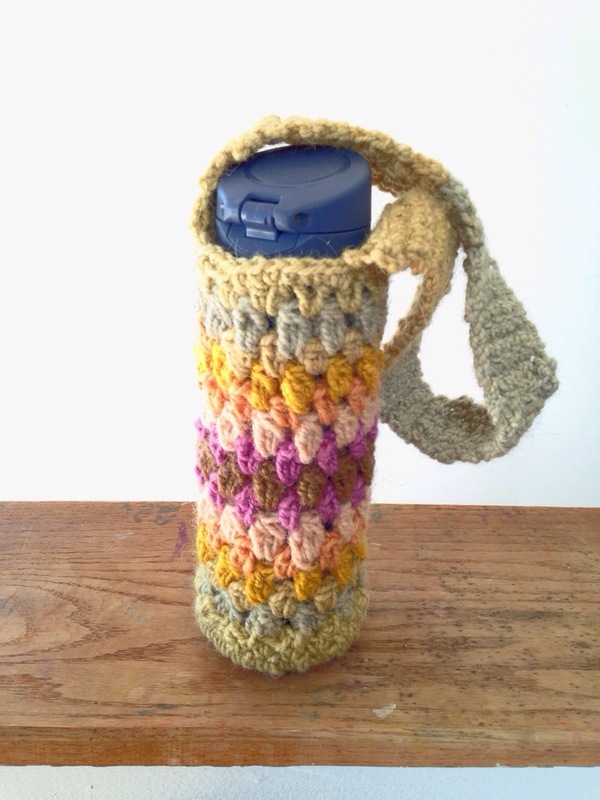 I have been wanted to make a carrier for my amazing water bottle for a long time. This was the perfect amount of yarn for it! Bonus, I also learned to crochet to make this project. It was a bit much to bite off for my first project, but it turned out fine. Also, this photo is a little saturated so the yarns look a bit brighter than they do in real life, but you get the gist. 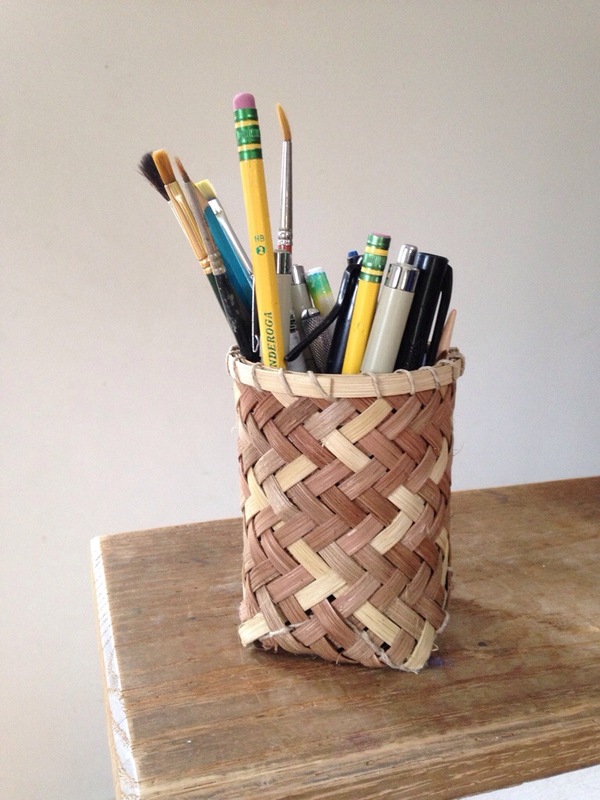 Here is another experiment with a new technique for me— a twill pattern basket. 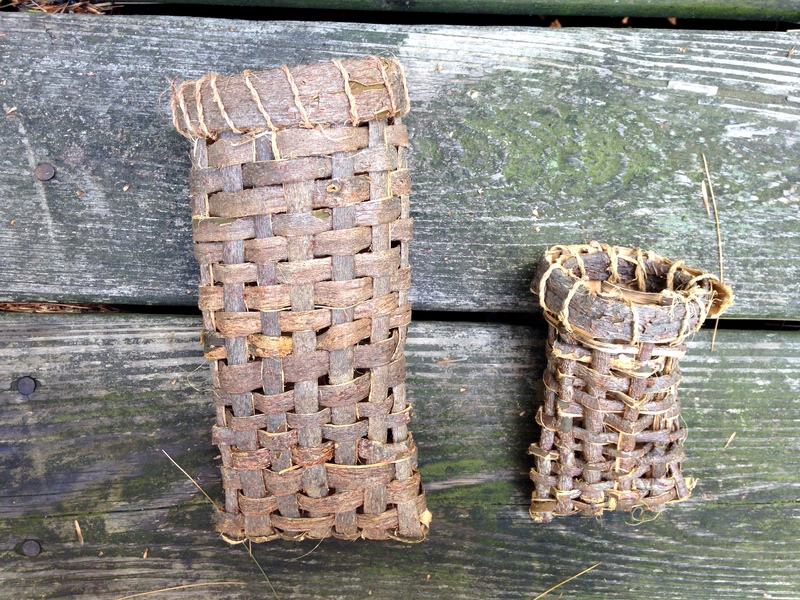 The brown splints in this piece were dyed with Pisolithus tinctorius. I didn’t rinse them too much after dyeing so a bit of the color is sitting on the surface, but I was impressed with how well the color took to the reed. I also dyed some with Phaeolus which turned out great— I’ll post them another time. 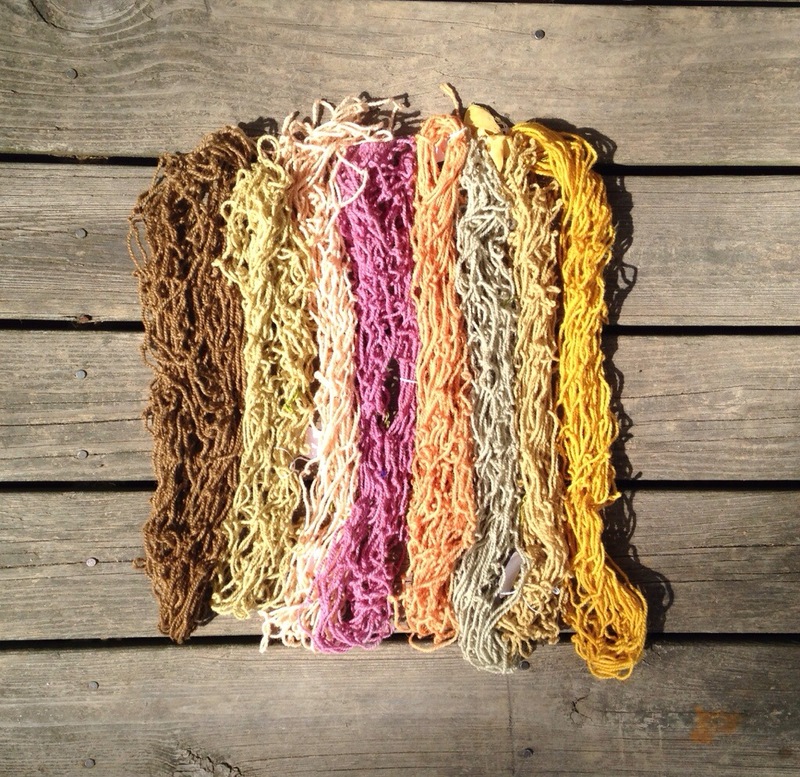 And lastly, here is a work in progress: a little mushroom dyes sample book. More on this as I finish each page! How interesting. I really want to try some mushroom dyes as well! It’s so much fun! Identifying the mushrooms is the hard part for me and finding a great teacher was key. Have fun in your endeavors!